Sensitive data is leaked via incoming and outgoing email communications which can pose significant threats to your organization without your acknowledgment and it is happening everyday. Email security solutions defend against spam, viruses, and malware, while protecting privacy with data loss prevention (DLP) and encryption technology.. In addition to spam-based attacks, email threats have evolved to highly sophisticated phishing campaigns, targeted zero-hour attacks and data theft aimed at exploiting risky user behavior. ​With 91% of hacks starting with a targeted email attack, organizations need to protect their users, data and assets. If you are running Exchange on-premises or it is hosted in the cloud, you also have to deal with the added challenge of email and business continuity. The Essentials for Email Security is to quickly filters every email before it hits your mail server to protect against inbound malware, spam, phishing and Denial of Service attacks. Features include sender spoof protection, domain name validation and anti-fraud intelligence. 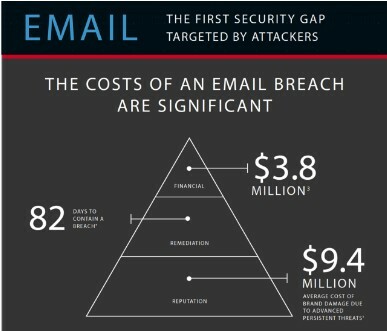 The Email Security Solution must constantly monitors the Internet for new email-borne threats across all attack vectors. The monitoring and filtering service is continuously updated with the latest threat definitions intelligence and software updates which means zero maintenance cost to your organization. 1. Block threats: Purpose of the spam filter is to block the spam from reaching the screens of your employees. The threat is automatically picked up and either held securely or immediately deleted. This is the best way to avoid activating spam malware as it is so easy just to click through links in an email that may seem authentic and important. The effects of that one tiny spam click may be instantaneous or may lie hidden for months. Removing the email before it becomes a risk is definitely a good option. 2. Filter legitimate emails: Real mails need to be able to stand out and avoid being trashed. Anti-spam filtering has sophisticated recognition abilities which will block only spam while allowing allow real mails to arrive safely in the mailboxes. 3. Meet data regulations: Many businesses are subject to strict privacy and data storage regulations, some more so than others. To continue operations, they have to meet certain conditions including always using spam filtering to reduce the risk of data breaches. 4. Protect your business reputation: You can see how uncomfortable the CEOs are when they hold press conferences to admit a breach. They have to acknowledge that they failed to protect client data. Not only will they face financial loss, but their business reputation is at stake. Anti-spam filtering can help ensure these scenarios do not happen to you. Filtering has come a long way in recent years with complex algorithms in identifying spam before it becomes a risk to any business. Real emails can now pass through safely without the classic catchcry of ‘check the spam folder’ and businesses can also work with greater productivity. You need emails but definitely not spam nor the disaster it may bring to your business. feeling insecure on your email security now? run a test now to figure out your if your email security is in place..